Drug offenses may result in both state and federal charges. Drug charges include charges of possession, manufacture, trafficking, or possession with intent to sell marijuana, cocaine, crack, heroin, and other controlled substances. A drug arrest is a serious matter that requires prompt attention from a lawyer experienced in defending drug charges. If you have been arrested for a drug offense you need the help of a criminal defense lawyer who is experienced in these cases. To schedule a free consultation with a dedicated and passionate Bridgeport, Connecticut, drug charges attorney, contact the Law Office of Tina Sypek D'Amato. Ms. Sypek D'Amato will begin your free initial consultation by learning the facts of your case as well as spelling out the most likely course of events. 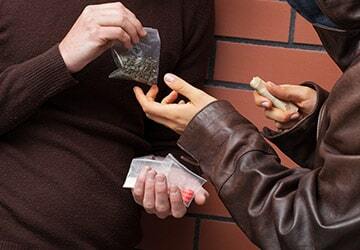 There are many circumstances that can lead to a drug arrest. Whether you merely use or if you sell illegal drugs Tine Sypek D'Amato will provide you with the effective, compassionate defense you need. As someone who has experienced the power of addiction firsthand, attorney Tina Sypek D'Amato is compassionate toward people who have been caught in the trap of drug use, possession, and trafficking. As a passionate criminal defense lawyer, Tina is determined to protect her clients' Constitutional rights through every phase of a criminal defense case. In many cases, a first-time drug charges offender in Connecticut has the opportunity to escape a criminal conviction through participation in a rehabilitative program such as a drug education program, an alcohol education program, or an accelerated rehabilitation program. Some of these programs are offered automatically, but some require the assistance of an attorney to secure your enrollment. Programs: There are several programs available to those who are arrested for drug possession. If successful, the program terminates with a dismissal. The Community Service Drug Education program can be used up to 3 times for good cause. Hallucinogens - Marijuana, LSD, PCP, Peyote, and Psilosyben, Ketamine, Mushrooms, MDMA, et seq., . Marijuana, although recently decriminalized, is still an infraction and illegal to possess, even in small amounts. Because the laws regarding marijuana are so new, police and courts are not sure exactly how to handle motor vehicle stops when marijuana is concerned, and often feel there is reasonable suspicion to search a vehicle when marijuana is suspected. Generally speaking, if an infraction is committed, the police may have the right to detain someone and even search their vehicle if they feel there is further evidence of that infraction in the vehicle. Furthermore, there may also be a question as to, if the police officer either sees marijuana in your vehicle or smells marijuana emanating from the vehicle, he may argue that he believed you are driving under the influence and you may be subject to arrest, even in the advent of Medical Marijuana. These issues regarding searches are still new and will be hashed out as time goes on. On many occasions, persons are caught with marijuana that is greater than 1/2 oz or packaged in several baggies. This may just indicate that you are a chronic user, you get a discount for buying in bulk, or that the person who sells only sells small quantities and so you purchase a number of bags at a time in order to avoid a constant visit to your local dealer. Prosecutors and police do not look at it that way. They will charge you with intent to sell every time. If you want a knowledgeable drug lawyer, Tina Sypek D'Amato is the lawyer for you. She is able to spot suppression issues and argue addiction and mitigation in order to get the best result possible. In addition you should be aware that possession with intent to sell or distribute means sharing with others or purchasing for friends as well. Therefore, sharing your drugs or purchasing drugs for a friend elevates your crime from simple possession, in the case of marijuana, an infraction, to a felony. Although simple possession of narcotics is a felony, the enhanced charge of distribution can significantly affect your sentence and make you ineligible for programs that would otherwise dismiss your case. Obviously, narcotics and controlled substancessold on the street are illegal and involve significant penalties and in may cases, mandatory minimum prison sentences. Those penalties are further enhanced if the possession occurs in a school zone, a certain distance of a daycare or in a subsidized housing project. These areas are virtually unavoidable, especially in a city. But narcotics that you obtained legally through a doctor's prescription can also be illegal if not stored in a proper container. If you want a knowledgeable narcotics lawyer, Tina Sypek D'Amato is the best lawyer for you. She is able to spot suppression issues and argue addiction and mitigation in order to get the best result possible. If there is a loophole, she will find it.